If you and your friends are looking for an affordable luxury cozy salon to pamper yourself from head to toe, we just found a new place. Recently we were at the grand opening of 115 By Kimarie & Hannan, a total beauty destination that combines hair, beauty and nail services in an elegant spot in Bangsar. 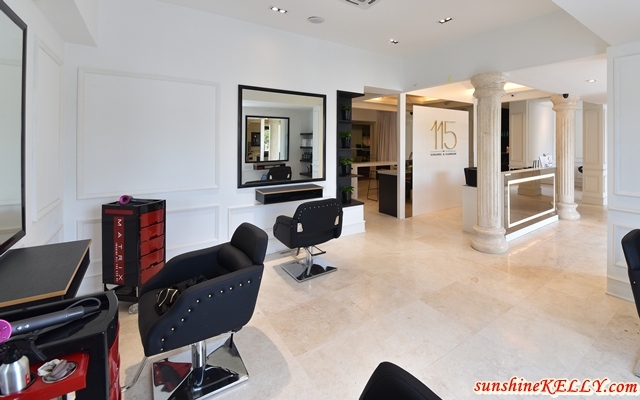 115 By Kimarie & Hannan salon is operated by Kimarie Salons and Hannan Medispa; two award winning market leading companies with nearly 30 outlets combined with philosophy beauty through science. Their latest 3D face scanning technology allows Dr. Hannan Yusof and their consultants to conduct in-depth analyses and provide solutions individualized to our needs. There are several solutions and non–invasive treatments such as V Shape face contouring, abdomen fat freezing, revive skin therapy, the first carbon dioxide dermabrasion therapy in Malaysia for rejuvenation and collagen production and also latest technology in hair removal which is painless. The salon is led by Matrix Artistic Educator, Roy Thean offered hair coloring with Nano techm ultrasonic hair treatments and latest products to cater to each individual. From the luxurious décor to the signature facial, hair treatments and also nails pampering, every detail at 115 is meticulously planned to create a holistic customer experience that caters to our needs for head to toe. looks like great place to visit. I need to pamper self too. Looks posh! Hope theie services are uber posh too, and satisfies their customers.